Three volumes (27 cm), I (1897): xiii, 602 pp. Entries 1-2386. II (1905): xviii, 593 pp. Entries 2387-3888. III (1909): viii, 653 (4) pp. Entries 3889-5394. Uniformly bound in contemporary half-morocco. - Pellechet-Polain is an incompleted union catalogue of incunabula in French libraries. The remainder of the alphabet (authors Gregorius IX - Zutphania, entry nos. 5395-11,887) was not issued until 1970 (in 23 volumes, a facsimile of Louis Polain’s manuscript). ¶ Leather decaying, joints cracked, but still sound. Offered with Bibliothèque nationale (France), Catalogue des incunables. Tome 2: H - Z et Hebraica. Paris: Bibliothèque Nationale, 1981-1985. 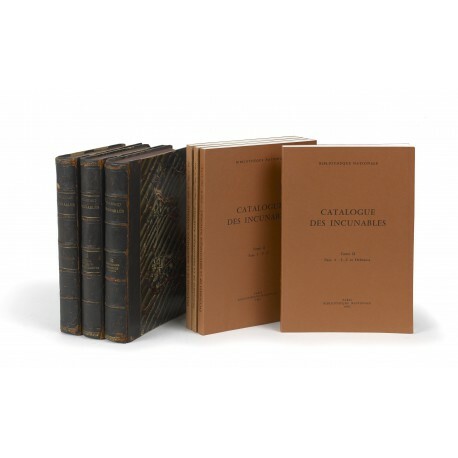 Four volumes (27 cm), as issued, in publisher’s printed wrappers. - The BnF’s “Catalogue des incunables” is an authoritative guide to one of the three great collections of fifteenth-century printed books (approximately 8500 editions in 12,000 copies). The editors commenced with the letter H, since the Library’s copies of authors A-G were recorded by Pellechet & Polain. They afterwards turned to the earlier part of the alphabet, and three more fascicules (Tome 1, Fasc. 1-3) have been published 1992-2006; those fascicules can be supplied on request. ¶ Fine copies. Three volumes (28 cm), I (1897): xiii, 602 pp. Entries 1-2386. II (1905): xviii, 593 pp. Entries 2387-3888. III (1909): viii, 653 (4) pp. Entries 3889-5394. Uniformly bound in contemporary half-morocco. 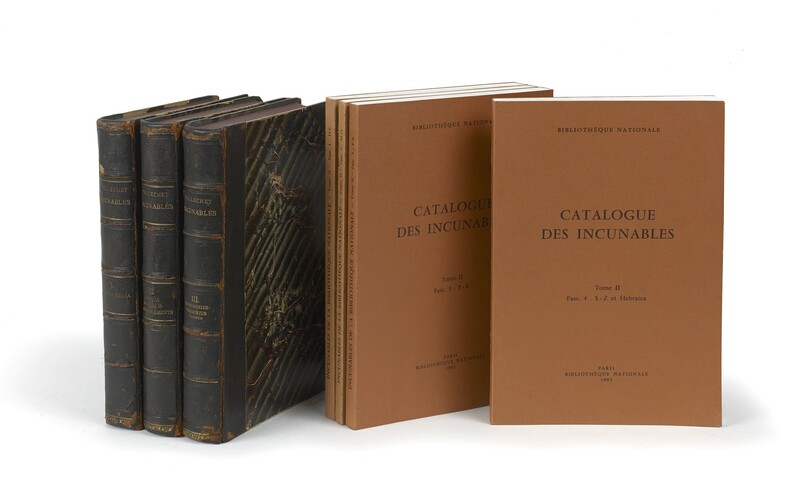 - Union catalogue of incunabula in French libraries. The remainder of the alphabet (Gregorius IX - Zutphania, entries 5395-11,887) was not published until 1970 (in 23 volumes, a facsimile reprint of Louis Polain’s manuscript). ¶ Leather decaying, joints cracked, but still sound. 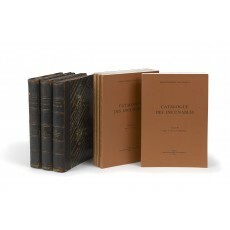 Four volumes (27 cm), I (H-L, 1981): 198 pp. Bifolium (half-title: Catalogue des Incunables; title-page: Tome II H-Z et Hebraica, dated 1985) loosely inserted. II (M-O, 1982): pp.-354. III (P-R, 1983): pp.-528 (2). IV (S-Z et Hebraica, 1985): pp.-783 (1). “Additions & Corrections” loosely inserted (16 leaves, printed rectos only). pp. Uniform publisher’s printed wrappers. - An authoritative guide to one of the three great collections of fifteenth-century printed books (approximately 8500 editions in 12,000 copies). The editors commenced with the letter H, since the Library’s copies of authors A-G are recorded in Pellechet & Polain’s Catalogue général des incunables des bibliothèques publiques de France (Paris 1897-1909). They afterwards turned to the earlier part of the alphabet, and three fascicules have so far appeared (Tome 1, Fasc. 1-3, 1992-2006; those fascicules can be supplied on request). ¶ Fine copies.